In 1996, the owners of Thorpe Park (Chertsey, UK) re launched their park with a very weird and unusual roller coaster. Called X:\No Way Out, it was a custom Enigma that was built in a pyramid. Themed as a computer virus wrecking havoc, the ride featured a single lift hill and ran 5 backward Junior Coaster trains. It featured 3 braking areas where the train was stopped for various show scenes and riders experienced effects. At one point, the train would move forward and backward. At another, heat would be blasted on riders. 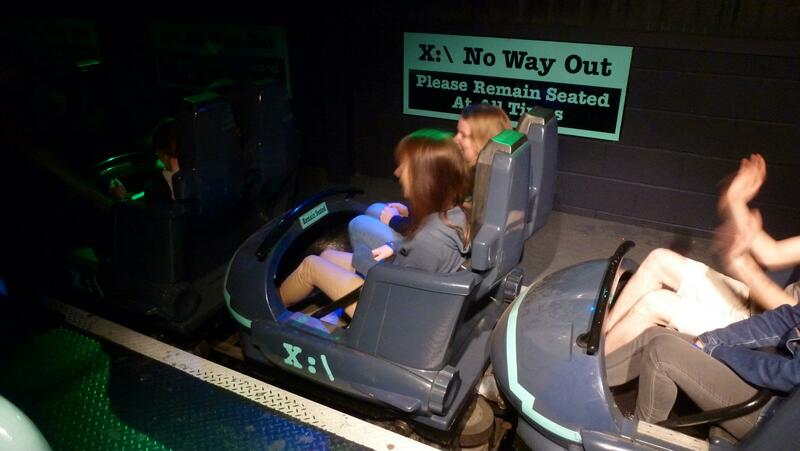 In 2013, the ride was renovated and became simply X. The trains were flipped forward and the theme is now a loud dance party, with techno music, lasers and lights through the ride. Vekoma had a hand in the renovation, as the original cars had large headrests due to the backward movement. 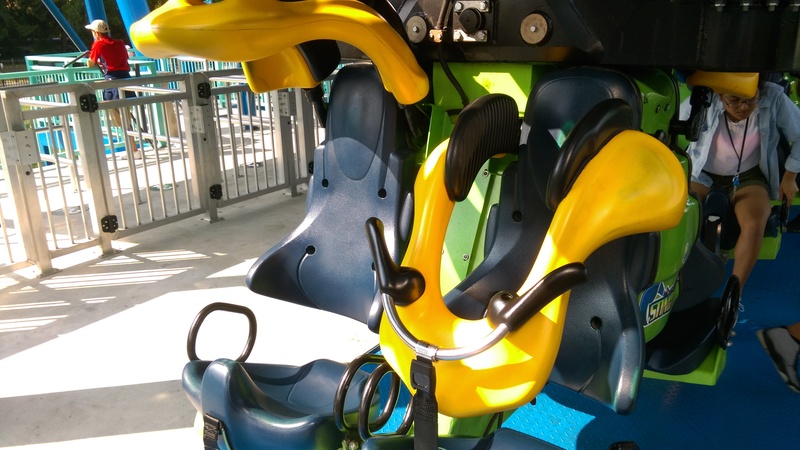 Vekoma removed the headrests and installed new individual T bars to replace the single lap bar per row. The original cars. Photo by Flex. 1996 saw Vekoma experiencing major difficulties with a prototype installed at Liseberg (Goteborg, Sweden). The prototype was a large Inverted version of the Boomerang known as an “Invertigo” with a unique train that has two rows of seats back to back. So, except for the first and last row, riders face each other and can see other rider’s expressions. Unfortunately, the advanced Linear Induction Motors used to launch the train did not work properly and the ride was delayed a year. The solution to that was to go with a silent chain lift for both hills, but is still a very complicated system. The seven cars train is trailered together and share six braking fins. One inch from the top of the fin is a groove. The chain lift has a catcher with 3 One Way Cams that are essentially jaws with many steel teeths and that can be pushed in by pneumatic bars to be forced open. Those teeths bite into the groove of the last fin on the train. When the train goes up backward up the lift and reaches the top, a hydraulic claw grab and hold the train in place. At that moment, release bars that are mounted at 45 degrees as their default position push in on the catch car and that force the Cams open, releasing the train. The claw is necessary, because the Cams cannot be opened when under tension. The train goes through the station, go through the 3 inversions and then reach the other lift hill. 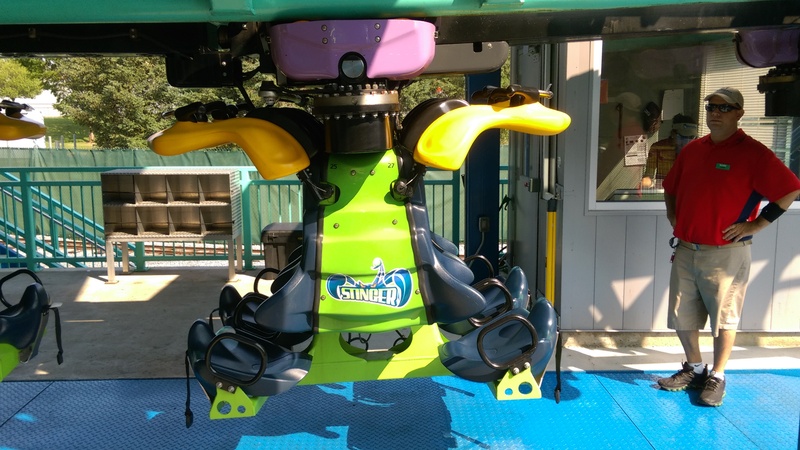 At that point, the release bars have the Cams open and the computer adjust the lift chain so that when the second fin on the train reach the catcher, they are travelling at the same velocity. At that moment, the release bars retract and that close the Cams on the fin. 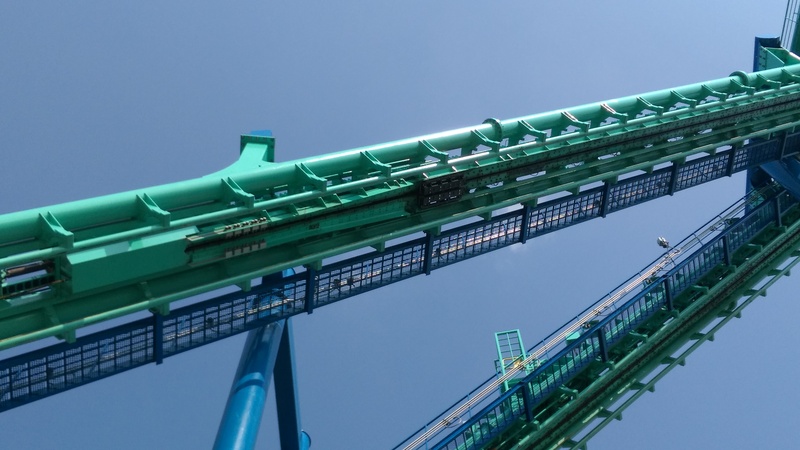 Once at the top, the lift hill will stop and the forward motion of the train will remove the tension from the Catcher momentarily, allowing the bars to push in and release the train. 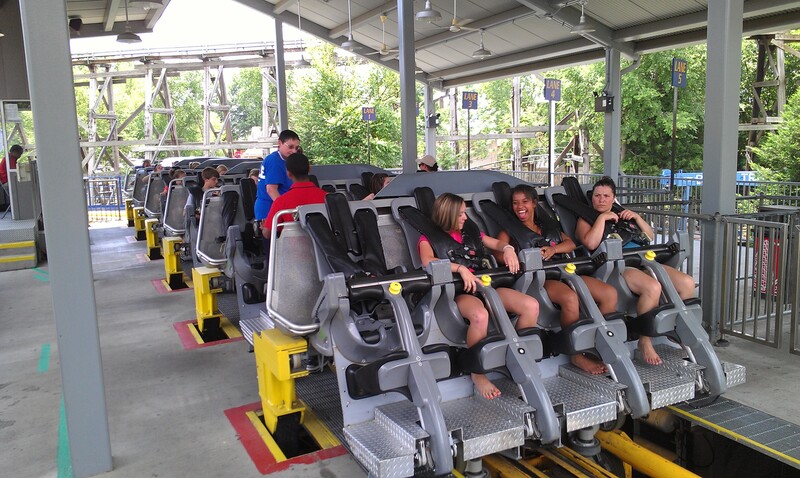 The train being held at the top of the first lift hill, waiting to be released. Backside of the lift hill. Front view of the attraction. 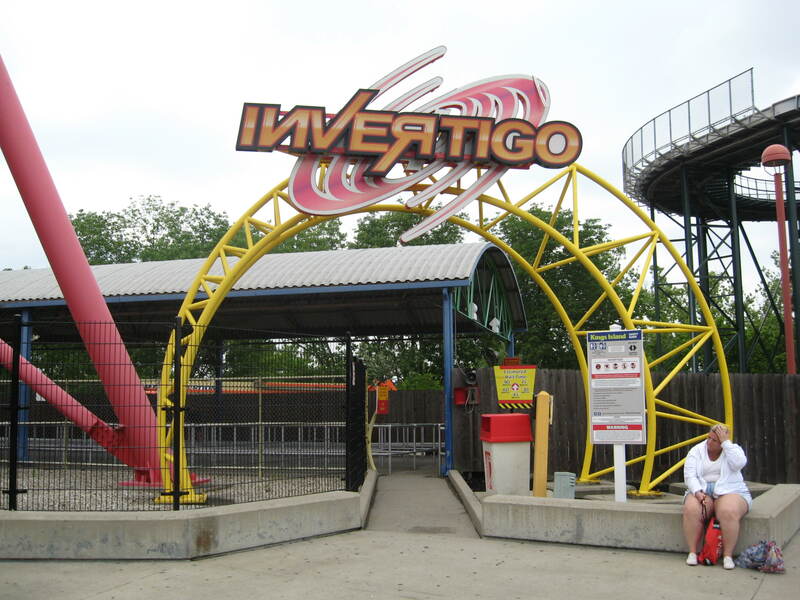 Invertigo entrance at Kings Island (Mason, OH). The long waiting line for Invertigo. The train going through the loop on Invertigo at Kings Island (Mason, OH). Most of the layout can be seen here on Invertigo. Once it reach the loop, the first lift has been brought down and again, the computer match speed so that when the last fin of the train reach the catcher, the Cams will bite the fin and then, the lift reverse and park the train in the station. The station pneumatic brakes hold the train during loading. From a maintenance point of view, 4 out of 6 fins see little use. Fin 2 and 6 need to be changed every 6 weeks on average. 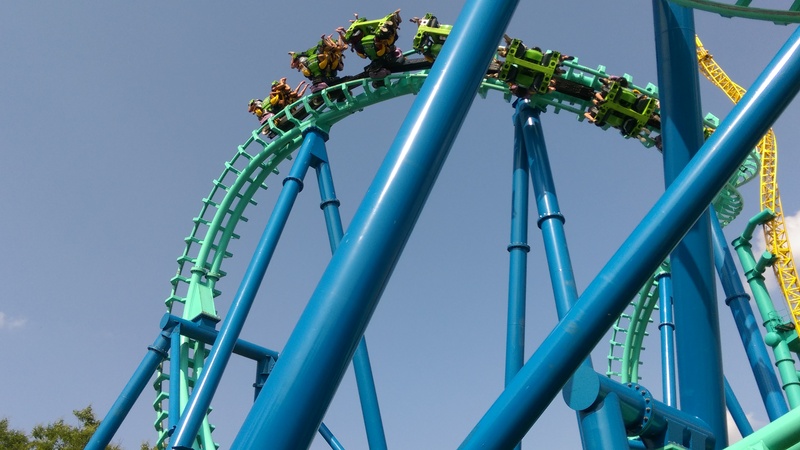 In 2011, Cedar Fair closed the 1998 Invertigo at California’s Great America (Santa Clara, CA) and moved it to Dorney Park (Allentown, PA). 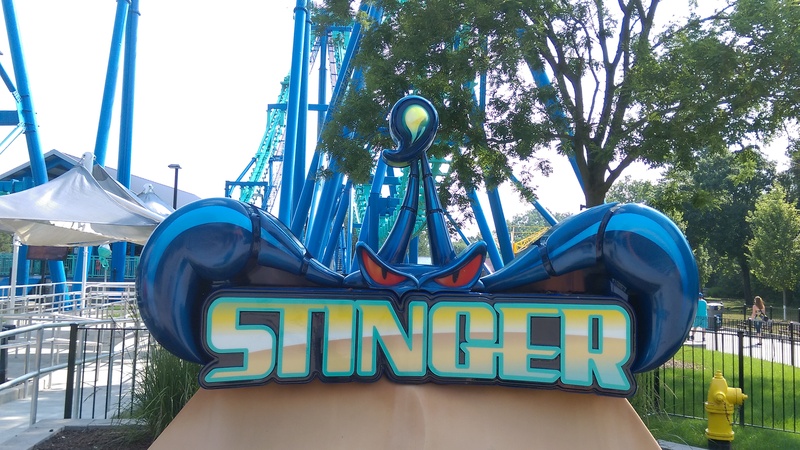 It was repainted and reopened as the Stinger. The catch car on the second spike. View from the loop to the second lift hill. Those brakes are only used when there is a early release or miscatch on the second hill. 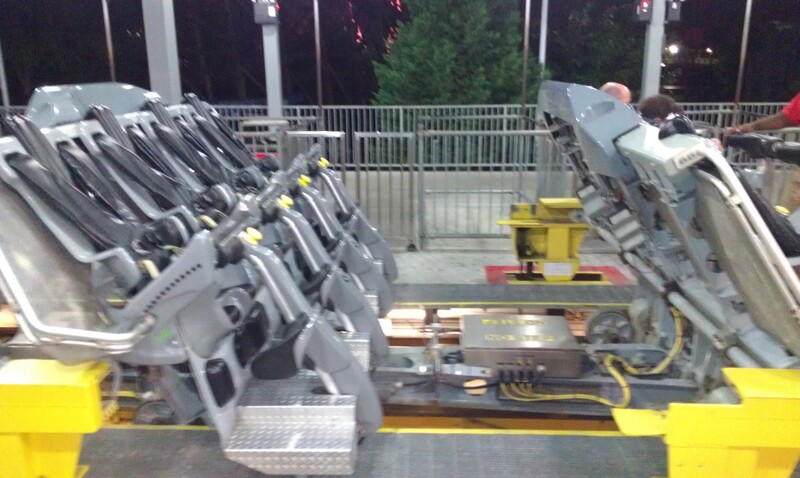 Those brakes will stop the train and prevent it from getting stuck between the loop and cobra roll. The train in the Cobra Roll. 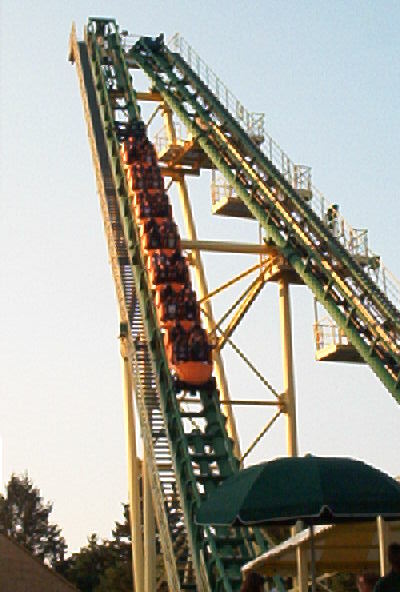 The last innovation of 1997 was the Vekoma MK-1205 trains. 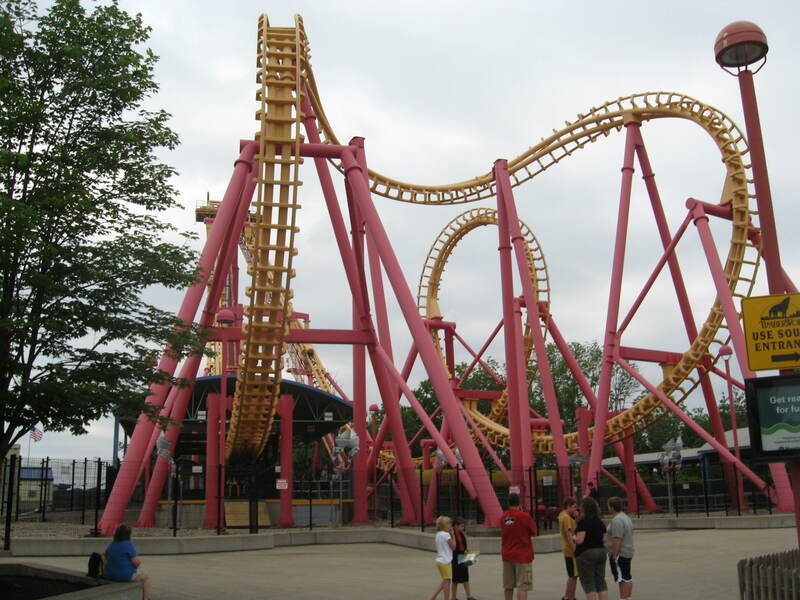 Those were the second evolution of the first generation Vekoma looping trains. They notably feature a very rounded nose on the front car and rider’s wise, there is more leg room. 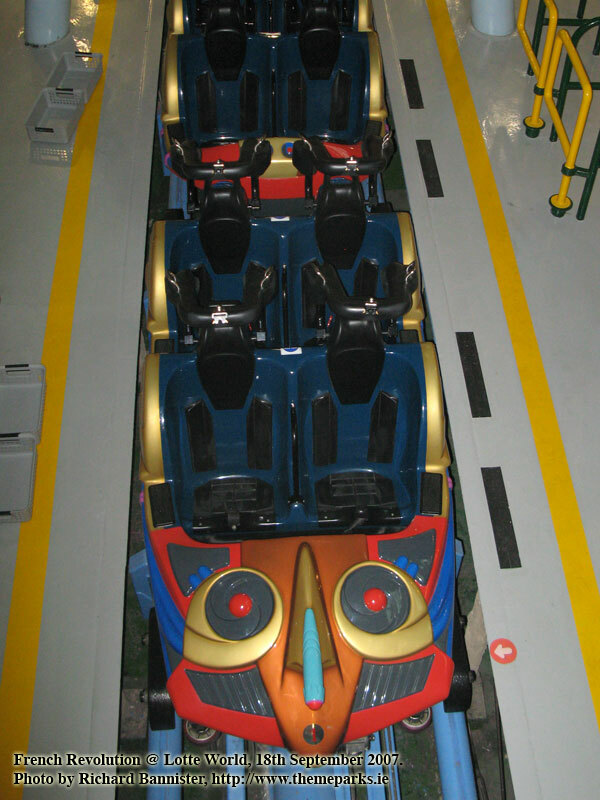 Boomerang deliveries in 1997 until 2003 featured those trains and French Revolution (Lotte World) got two new MK-1205 trains in 2003 with custom bodies. Parc Asterix for Goudurix, Efteling for Python swapped their original Arrow trains for brand new MK-1205 in 1997. 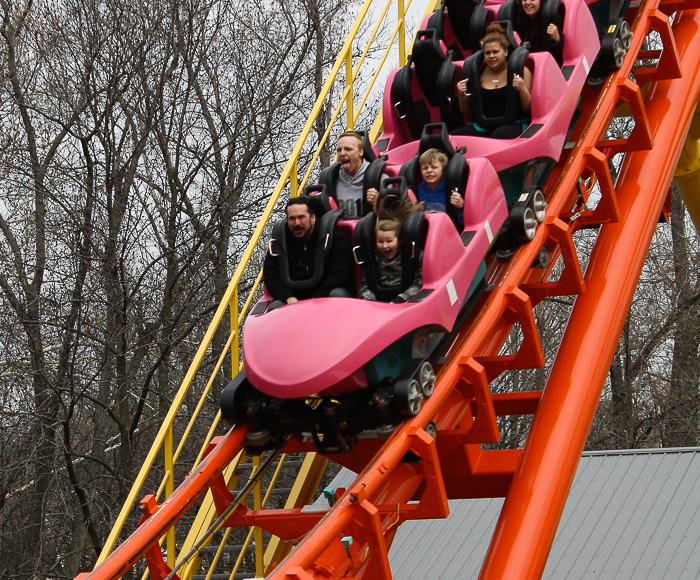 Pink MK-1205 train on the Boomerang at Worlds of Fun (Kansas City, MO). MK-1205 train waiting in the station of Zoomerang at Lake Compounce (Bristol, CT). The orange train on Zoomerang waiting to be released. One of the two custom MK-1205 train in use on French Revolution. 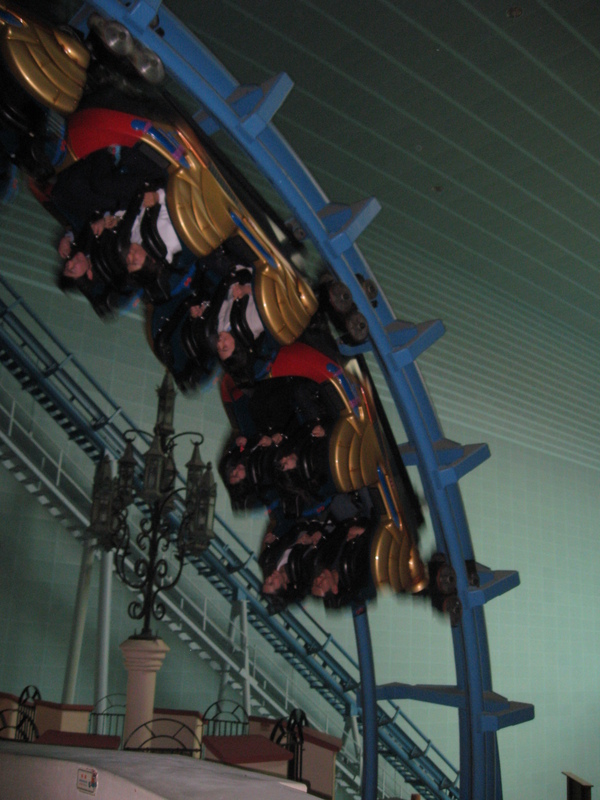 Lotte World (Jamsil, South Korea) replaced the original trains with those in 2003. The French Revolution in the middle of the loop. 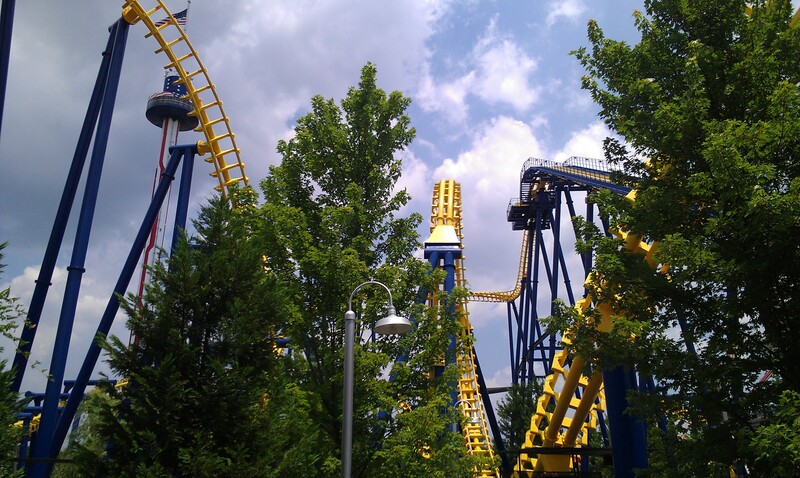 1999 was the next major step for Vekoma, as they finally successfully opened a launched coaster. For the needs of Walt Disney Imagineering, Vekoma designed and built a brand new compact launched coaster that would be able to fit inside a small soundstage and have impressive capacity, able to move 1600 to 1800 riders per hour. The end result was the LSM Coaster. Opening in august 1999 at the Disney MGM Studios theme park at Walt Disney World (Lake Buena Vista, FL), Rock n Roller Coaster was a major success. Vekoma designed cars fitted with speakers and an onboard computer to play music, Aerosmith in this case. The ride was delivered with 5 trains and it can run 4 at any time. From a construction point of view, in order to avoid expensive footers in the wet and spongy central Florida ground, the gravity building portion was designed to have a 3 feet deep cement slab. All the supports are bolted to it. The launch system was designed by Intrasys from Germany and feature Linear Synchronous Motors (LSM) to launch the train. Now, what make it unique is that unlike other rides where the permanent magnets are mounted to the cars, in this case, they are mounted to a sled. The sled run on a second track built inside the main one and they work on the principle: electric magnets are magnetized and shut down in a precise sequence so that they propel the sled with the magnets on it. After the launch sequence, the sequence is done in reverse in order to reset the system for the next train. Pneumatic pinch brakes are also used to stop the sled. In the case of the LSM Coaster, pusher tires drive the train out of the station and around a left hand turn. It parks itself and wait for the pusher cart to place itself in position. Two sabots are mounted on the sled and two mechanical pivots allow the sabots to go in reverse, but will push the train in forward. Unlike Space Mountain, the motors do not place the sled on the pieces. Instead, the pusher tires reverse the train until it rest against the sled. Once the train is ready, the pinch brakes open before the Roll Over and then the pusher tires split open. The train is launched from 0 to 54 mph in 2.8 seconds and then executes a 80 feet tall Roll Over inversion. The train follows it up with a large banked turn against the wall of the building and then does a rising 270 degrees turn into the first brake run. The train is not slowed down at all and dives down to the left into a curving drop. The course take us around the building before diving into a Corkscrew. The train rise into another brake run and we again dive to the left and we go around the lower portion of the building, doing a zero g hill over the launch segment and heading into the final brake run. There is enough space for two trains on that braking zone and the transfer track is between the brakes and the unload station. After the unload, it turn to the left and go back to load. Two more LSM Coaster was built in 2000 and 2002. 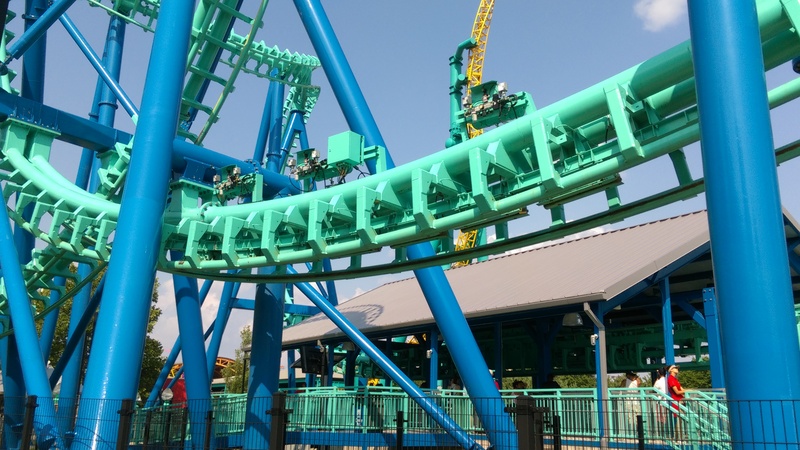 Originally supposed to be called Riddler’s Revenge and painted green and black at the factory, Six Flags changed their mind at the last second. It was installed in 2000 at Walibi Flevo, which became Six Flags Holland that year. It was repainted after installation to red and blue and renamed shortly before opening “Superman: The Ride”. The ride itself run two standards MK-1205 trains with the chain dogs removed and the launch pivots added. The layout itself is the same, but the Roll Over 4 feet taller and the ride a little more spacious, as the lighter trains launch faster; 56 mph versus 54mph for the two Disney installations. It also uses standard footers as it is built over a pond. The last LSM Coaster is the Rock n Roller Coaster at Walt Disney Studios Paris (Chessy, France). Beside the theming differences, it opened as a clone of Florida ride wise. 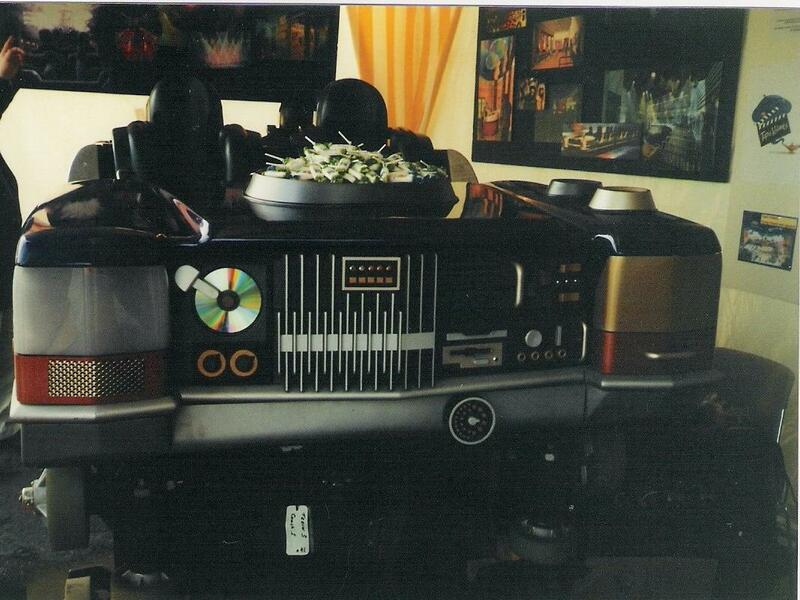 The first public picture in 2002 of the Paris Rock n Roller Coaster train. The storyline in Paris is that we are experiencing a new way to feel the music, so the stretch limo trains were updated to this. Sideview of a Rock n Roller Coaster car at Walt Disney Studios. 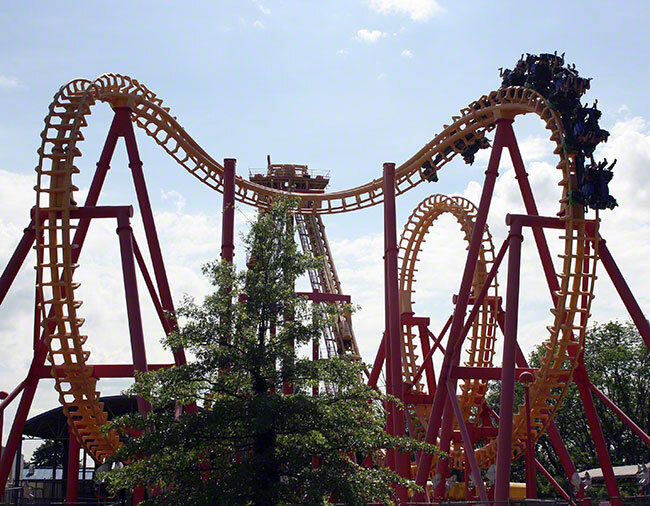 1999 was to bring the third generation Boomerang roller coaster and Six Flags Fiesta Texas (San Antonio, TX) announced one to debut that year. It would have featured a sitdown train and greatly increased dimensions, with a nearly 200 feet tall pair of lift hills. 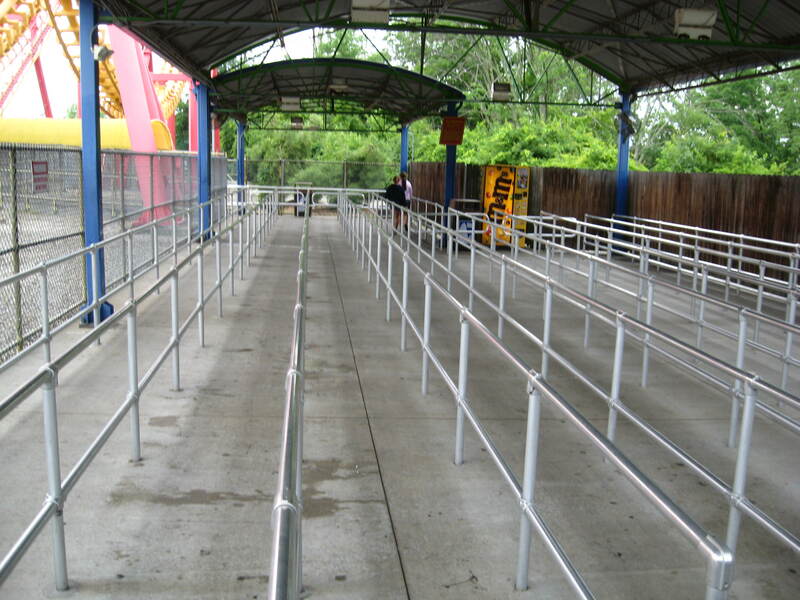 Unfortunately, when opening day came around, Fiesta Texas got a regular Boomerang instead. The same thing happened in 2001 at the rebranded Six Flags Belgium (Wavre, Belgium). 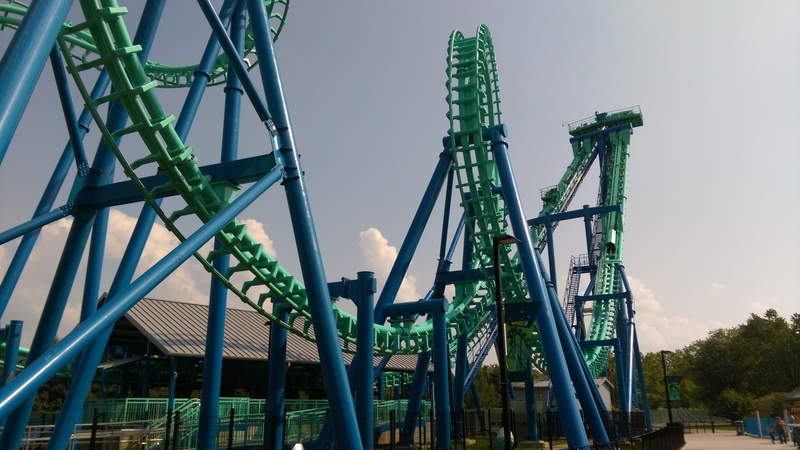 A Giant Boomerang like what was promised at Fiesta Texas was announced, but the site Six Flags had selected was unfit for such a giant installation. Other areas were looked at, including in the middle of the park, but eventually, the park installed a regular Boomerang near the main entrance at the original site. Throughout 1999, Paramount Parks and Vekoma partnered to design Stealth, the world’s first looping flying roller coaster. The first flying roller coaster was the very short lived “Skytrak” at the Granada Studios in Manchester, UK. 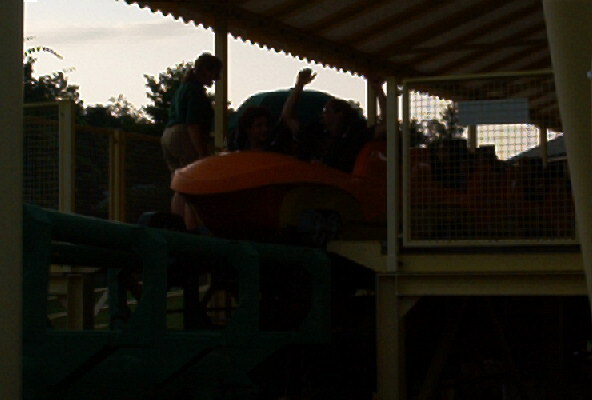 Built in 1998 by a subsidiary of British engineering firm Fairport Engineering, this unique roller coaster used a single rail design with small cars where the “seat” would come down at an angle in the station. The rider would climb and then go up the small lift hill and then around the small layout. The ride only had 5 single passenger cars and had very low capacity. When the park closed in 1999, the ride was scrapped. 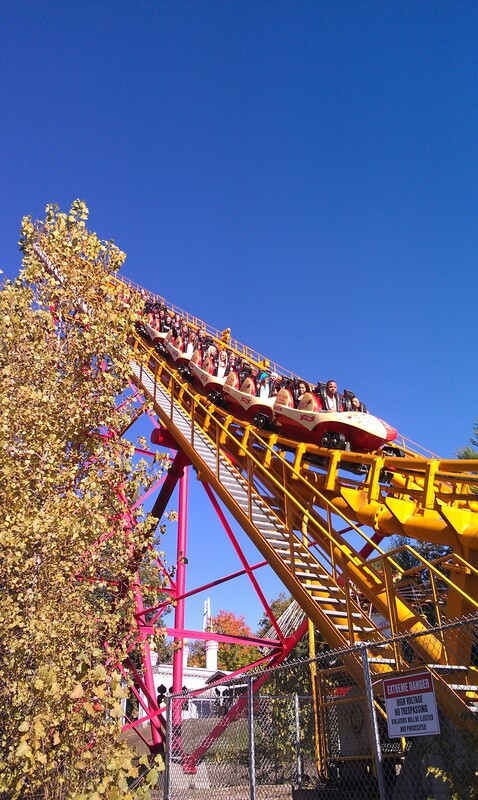 The first Vekoma flying coaster went to Paramount Great America in Santa Clara, CA. It lead to the removal of both the Yankee Clipper Arrow Hydro Flume and the park Steam Train. The total budget for this installation was 17 million dollars US. So, Vekoma designed a compact layout that would feature a vertical loop and a double corkscrew. The load, lift and part of the layout including the inversions would be done when the track was upright, which left riders on their back. 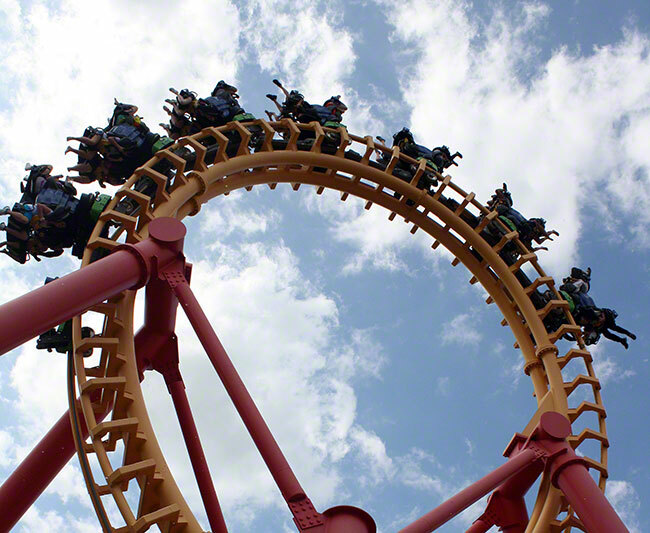 At 4 points during the ride, half corkscrews and half rolls would flip riders so they would either be on their back or in a flying position. Each of the two trains features 6 cars, with a 4 across layout. When loading the seats push up to a 60 degrees angle and riders take a seat facing backward. They then need to take flexible rubber straps and “put them on”. 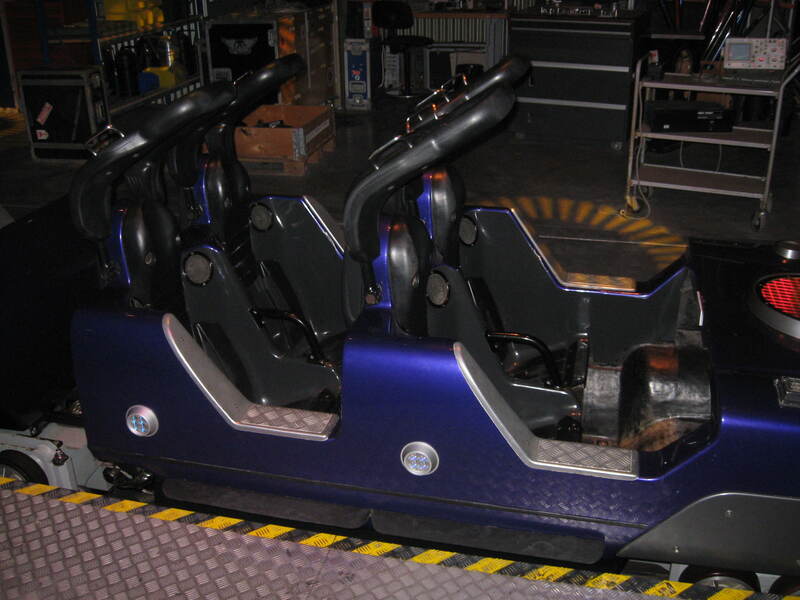 Once both straps of the vest are buckled in, the ride operators pass at each seat and push in a T shaped lap bar. In addition to the standard ratchet locking system, a back-up locking mechanism was designed in as well. The lap bar has metal teeth on each end and those go in notches designed into the armrests. You can see the seats and lap bars. Notice the leg restraints on those bars as well. 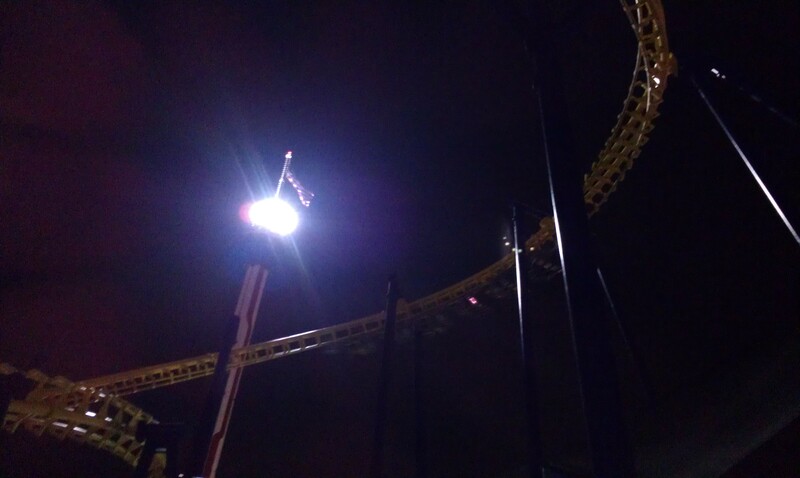 The train on Nighthawk (relocated Stealth) during loading. 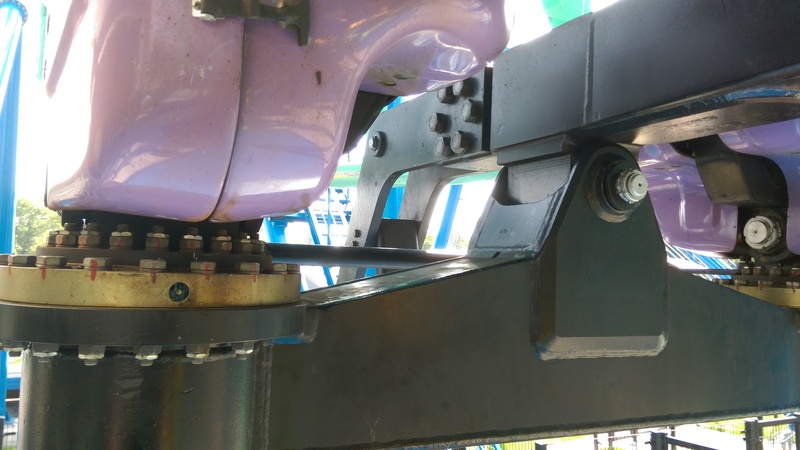 The original plan was to have on-board hydraulic cylinders that would slowly lower the seats to a position where riders back were parallel with the track, but technical issues prevented that on Stealth. Instead, the seats were lowered and raised in the station using 12 hydraulic cylinders that move the seats. The yellow metal pieces are the end of the hydraulic cylinders. Each car has a wheel on each end and those go in the middle. That way, there are no sudden or abrupt movements when the cars are moved. The train is ready to dispatch at this point. The ride started with the 30 degrees angle 115 feet tall lift hill. Once at the top, the train dipped down to release from the chain and went around a slow curve to the left. The train was then flipped and riders flew down in a flying position down the first drop. Once at the bottom, riders reached 51 mph and then went up in a 110 degrees “Horseshoe” curve. 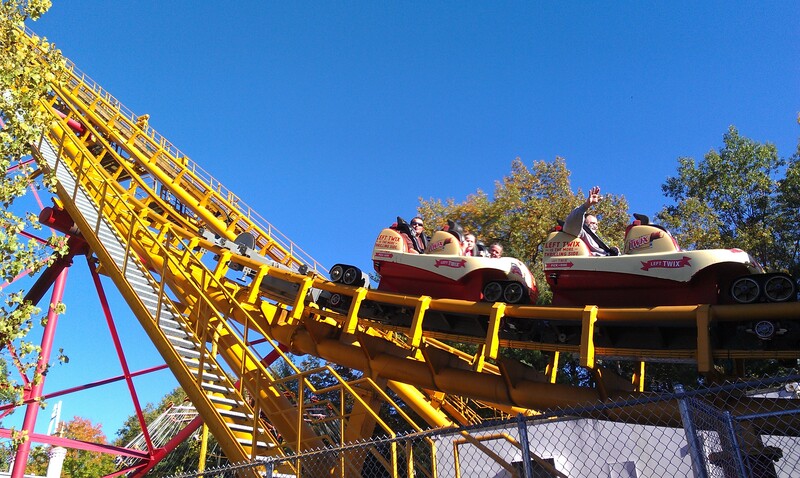 After the Horseshoe, the train went up to the right before flipping down into the 66 feet tall vertical loop. Riders experienced 4.3 G’s in the loop. The train was then flipped back to a flying position and the train went around to the other side of the lift. One last flip put riders back on their back for the double Corkscrew and the ride concluded after 2766 feet of track. 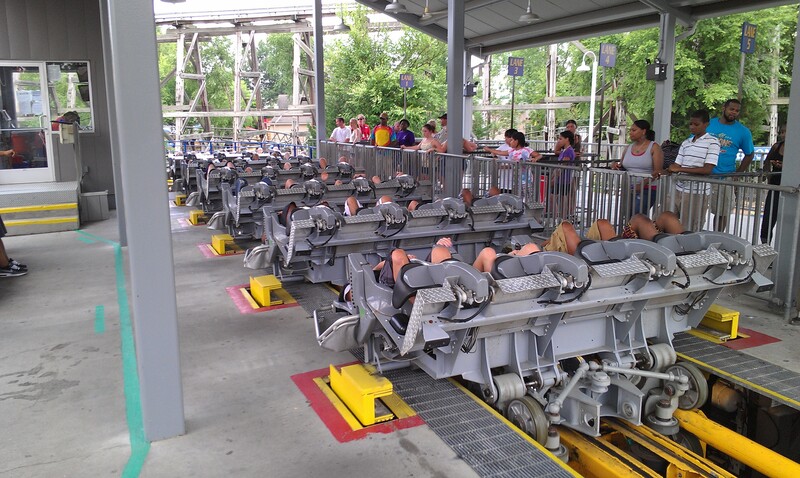 Once on the brake run, the train has to wait for the other to be dispatched to return to the station and release riders from their lying down position. 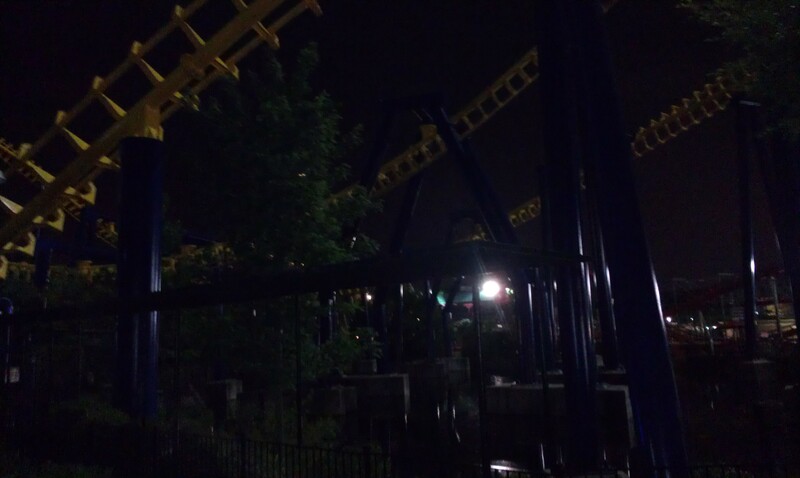 The lift hill and loop throught the trees on Nighthawk. The ride was very popular and appreciated by the guests of the park, but after 4 short seasons, Paramount decided to go into another direction with their Paramount Great America property. 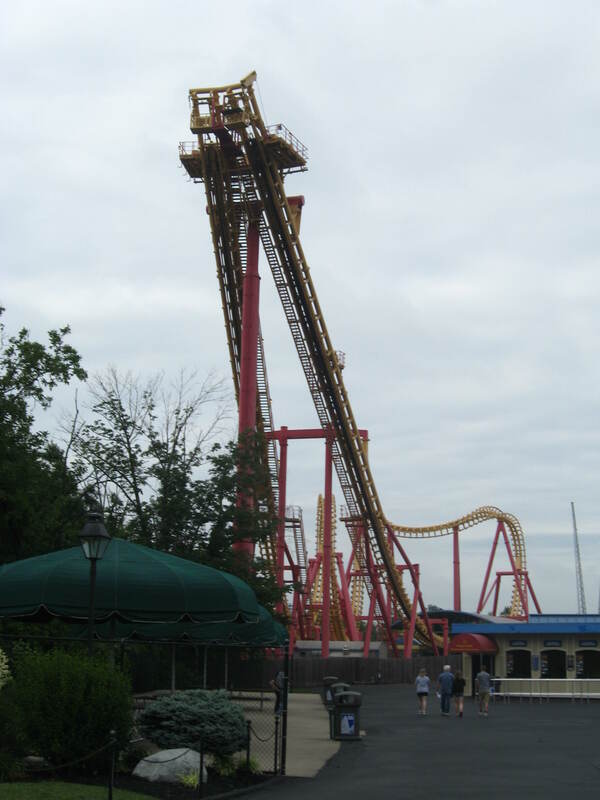 Stealth was removed after the 2003 season and replaced at Great America by the Boomerang Bay water park. 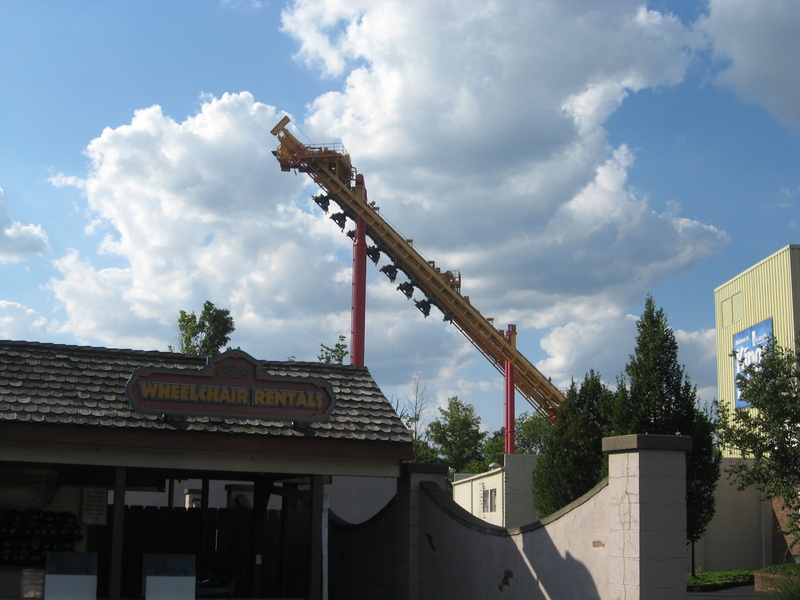 It was sent to Carowinds (Charlotte, NC) where it was renamed at the time “Borg Assimilator” and given a Star Trek theme. The iconic Borg Sphere was crashed in the middle of the ride and the waiting line had various references to the iconic Star Trek villains. When Cedar Fair purchased Paramount Parks, all their intellectual properties were removed and rides renamed. Borg Assimilator was renamed Nighthawk and all Star Trek references removed. It was then repainted to a yellow track with blue support color scheme. 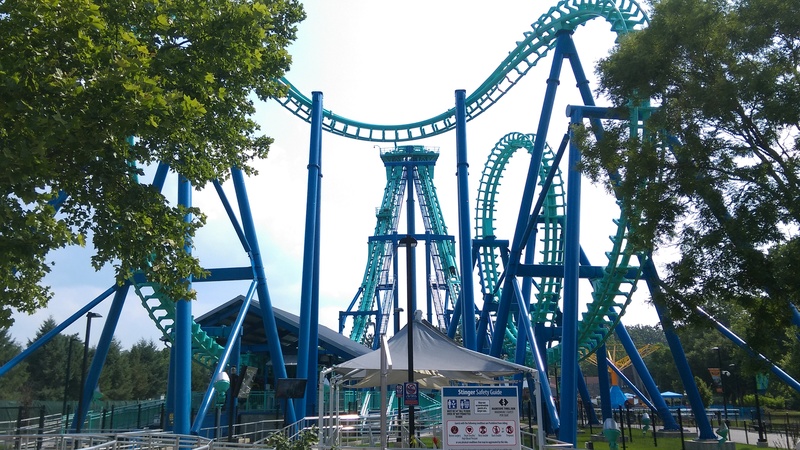 This entry was posted in Coasters, Industry Profile and tagged Boomerang, Disney MGM Studios, Fiesta Texas, Flying Coaster, Great America, Invertigo, Kings Island, Lotte World, rock n roller coaster, Stealth roller coaster, Thorpe Park, Walt Disney Studios, Walt Disney World. Bookmark the permalink.